A press release by the 'Society for Personality and Social Psychology' was posted in Watts Up With That and many other places: 'Facts, beliefs, and identity: The seeds of science skepticism'. It really is not worth reading, unless of course you take pleasure in observing the behaviour of the inmates of Bedlam at close quarters. 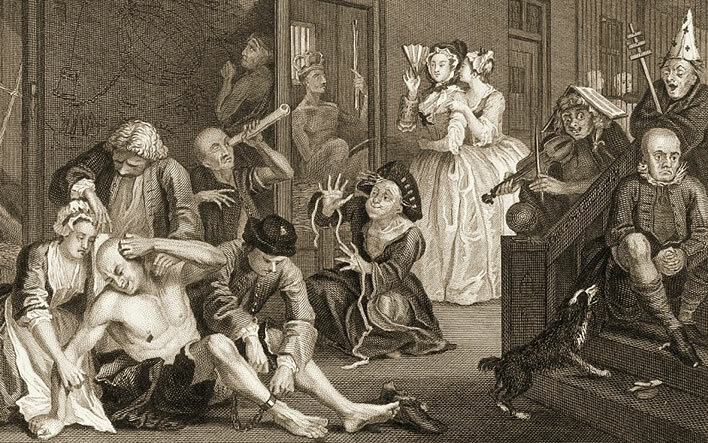 William Hogarth (1697-1764), A Rake's Progress, 1734, 'Scene in Bedlam'. Or is it a safe space at the SPSP Annual Convention, 2017? Difficult to tell. One really mustn't mock the afflicted, but this meeting is just the usual pseudo-intellectual, cod-science effort in social psychology, wondering why sceptics can possibly be sceptical. The answer to that wonderment is suprisingly easy and can be supplied in four words: 'Because CAGW is nonsense'. Those with strong stomachs can download the full programme PDF. Bedlam is on page 135. The 'Anti-Enlightenment Movement'? If you predicate all your thinking on the assumption that everything you personally believe in is a priori true then sooner or later serious derangement sets in. Let's just present the executive summary. In the Enlightenment– correct me if I am wrong, a bit of broad-brush stuff here, I admit – brave individuals and small groups of writers and thinkers at considerable risk to themselves took on the might of cult religious doctrine and brute political power to establish rational standards of thought. In the Anti-Enlightenment– according to Hornsey, Campbell, Kahan and Sutton – brave individuals and small groups of writers and thinkers at considerable risk to themselves are taking on the might of cult 'scientific' doctrine and political power to establish rational standards of thought. Sounds about right to me, but I'm not sure that's how Hornsey, Campbell, Kahan and Sutton and the assembled snowflakes in San Diego really mean it. The Anti-Enlightenment according to them is defined by the repetition in close, osmotic proximity of particular labels. From various abstracts: 'climate skeptics', 'anti-vaxxers', 'creationism', 'divine creation', 'the nonexistence of climate change'. The only shock is that they seem to be ignoring grassy knolls, 9/11 and the current whereabouts of Elvis (he works down the chip shop, we understand). Four studies examine the correlates of conspiracies alleged by each side of the climate debate, namely “denialist” conspiracies (about scientists and governments) and “warmist” conspiracies (about oil companies and their alleged mouthpieces). Results showed that denialist but not warmist conspiracy theories were related to nonrational thought and rejection of science. Oh, right – glad we have cleared that one up: warmist conspiracies are rational, denialist conspiracies are non-rational. Guards! Seize that man and administer his meds. 'Safe space', my foot: use force if you have to! At the moment the Enlightenment seems partly to be running backwards: in Great Britain the citizens have decided against the European idea; in eastern Europe politicians are being celebrated for stirring up the persecution of refugees and erecting fences against them; the new US President is called Donald Trump. The poor old Enlightenment has had many strange things to bear in its name over the centuries. Now it includes the 'European idea', the uncontrolled and unconditional acceptance of foreigners across open borders, and Presidents not called Donald Trump. Ah well, let's keep going and see what else our modern Socrates has to say. […] For a long time it has been about more than the refugee crisis, nationalism or anti-liberal ideas, more than just getting involved in current debates. In Donald Trump a man has become President of the most important enlightened nation whose rise depended to no small part on lies, half-truths and skilfully placed fake news. And with that he succeeded excellently. […] How certain knowledge can be obtained and validated is a central responsibility of philosophy – at least that is what it has asserted over thousands of years. Two-and-a-half thousand years of philosophy have not produced one single bit of 'certain knowledge' or validated 'truth'. On the contrary, if these gloomy years have taught us one thing, it is that 'truth' is a dangerous will-o'-the-wisp, which we trust and follow at our peril. Don't forget that it was philosophers who burned Giordano Bruno; philosophers, too, who developed Communism and National Socialism. Every tin-pot despot in the history of the world has had his philosophical entourage. Enough already! There is only so much humour one can take at one sitting. Mme Defarge's needles are click-clicking. If he's lucky it will be the re-education camp, if not – blink twice, citoyen, in the interests of scientific knowledge and truth.